Russell, Wilson, Jenkins and Fox saddled up. 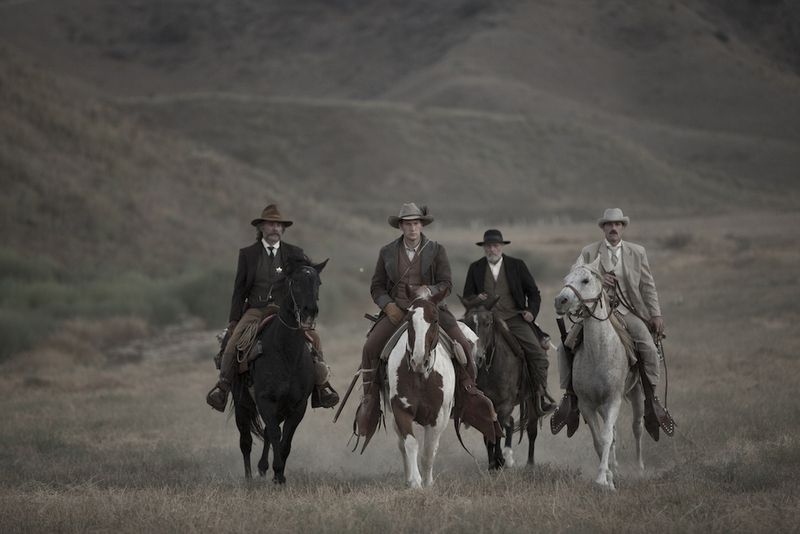 Bone Tomahawk is a traditional western to its core. The archetypes and themes are all present: bandits, savage natives, a virtuous sheriff, his loyal backup deputy, a stalwart cowboy, a fancy gentleman and a damsel in distress. Hell, there’s even a tired old drunk piano player in the town’s only saloon, with the unmistakable character actor James Tolkan (Back to the Future Trilogy, Top Gun) cleverly cast as a cameo in that classically styled role. 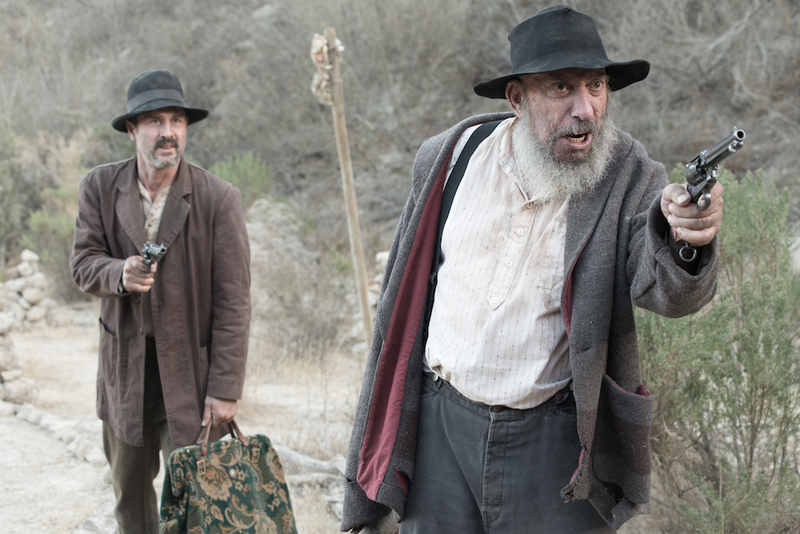 David Arquette and Sid Haig play a couple of dimwitted bandits. The film opens on a familiar western setting, a dusty, scrubby landscape, mountains in the distance in the mid to late Nineteenth Century. It’s a casual scene of brutal violence wrought on a sleeping man by a pair of bandits played by horror fan favorites Sid Haig and David Arquette. The scene plays out realistically, very much how one would expect these sort of situations unfolded in the American Western frontier. The action is elevated by stylized and poetic dialogue. These bandits may be monstrously callous, but they are endearing presences. One of these bandits wanders into Sheriff Hunt’s town (Kurt Russell). The town is so small, that a stranger in their midst seems immediately suspicious. The Sheriff injures the bandit during his arrest and the town medic Samantha O’Dwyer (Lili Simmons) is called in to tend to him overnight in his cell. Come morning, Samantha, the bandit, and the sheriff’s young deputy are missing. An arrow is found in the jail that a local native recognizes as belonging to a tribe of dangerous of troglodytes (cave dwellers). The Sheriff and Samantha’s husband Arthur (Patrick Wilson), a cowboy with a badly injured leg, set out into the mountains on a rescue mission. An Indian-hating gunman named John Brooder (Matthew Fox) and Sheriff Hunt’s childlike backup deputy Chicory (Richard Jenkins) come along; Brooder to kill Indians, Chicory out of blind loyalty and admiration for the Sheriff. Richard Jenkins stealing a scene as Chicory, Sheriff Hunt’s backup deputy. The film is simply shot. The lighting is dark and natural looking. There is very little musical score, and the combination of the straightforward cinematography and natural soundscapes make the experience an immersive one. Like the greatest films, there comes a moment very early in the picture when you forget that you’re watching well known actors play out a fiction. The characters’ lives seem to genuinely be in peril at every turn, and by the time the third act begins your heart is thumping and you’re biting your nails. Lili Simmons as Samantha O’Dwyer tending to her injured husband Arthur (Patrick Wilson). The real star of the film is S. Craig Zahler’s dialogue. Simple three to five word phrases that move the story along do-si-do with longer poetic monologues that reveal insights into the themes of the film and into the characters themselves. 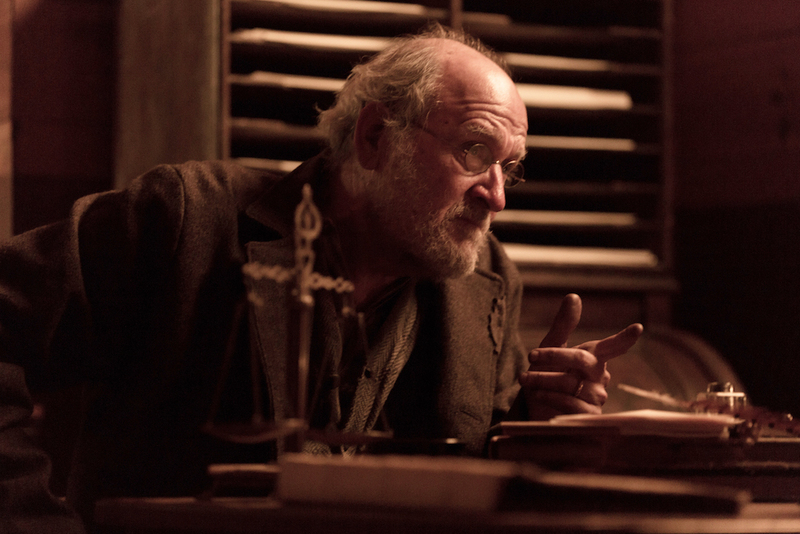 There are some exchanges mostly with Richard Jenkins’ character that serve as classically styled mild comic relief. In one scene Jenkins enters the jail and says “tea smells gruesome.” The Sheriff replies “it’s soup.” Fans of the films of Joel and Ethan Coen will recognize a kindred style here. 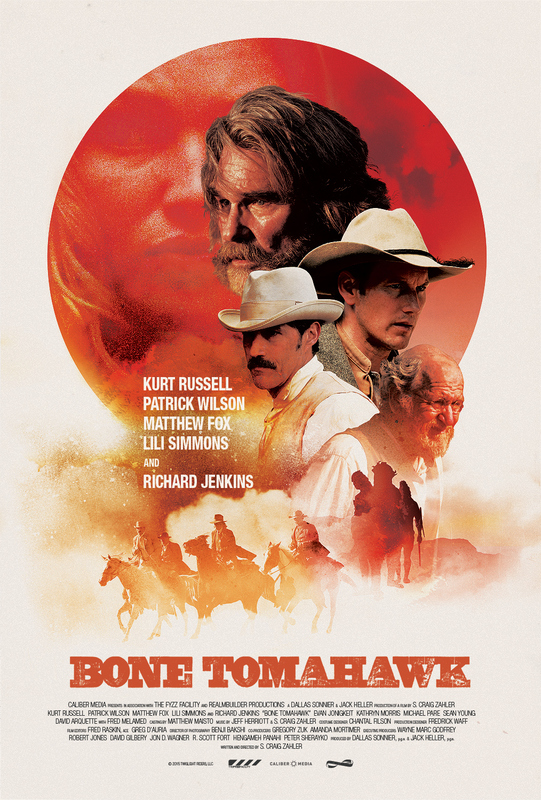 So, is Bone Tomahawk a western or is it a horror movie? It’s both and it’s a masterpiece of both genres. Mature horror fans often complain that the genre has devolved into mindless characters droning along through plots that serve essentially as a conveyance to the meat grinder. How often do we find ourselves talking about how we fell in love with the protagonist of the latest found footage film? Do you even remember their names or motivations, or do you just remember how they bought the farm in dramatic or gory fashion? Much like Psycho, Jaws, Deliverance or Alien, the audience gets to spend much of the film getting to know the endangered principals. We love these men and we want to see them make it out the other end of the valley in one piece. The horror comes into play when it dawns on you that they all won’t, and boy is it effective. NOTE: you can listen to my interview with writer/director S. Craig Zahler here. SYNOPSIS: When a group of cannibal savages kidnaps settlers from the small town of Bright Hope, an unlikely team of gunslingers, led by Sheriff Franklin Hunt (Kurt Russell), sets out to bring them home. But their enemy is more ruthless than anyone could have imagined, putting their mission – and survival itself – in serious jeopardy. Kurt Russell (The Hateful Eight, Tombstone) leads an all-star cast, including Patrick Wilson (Insidious), Matthew Fox (“Lost”) and Richard Jenkins (The Cabin in the Woods) in this gritty, action-packed thriller chronicling a terrifying rescue mission in the Old West. Kelley’s essay on the Western Horror Theme at Night of the Living Podcast the Blog!